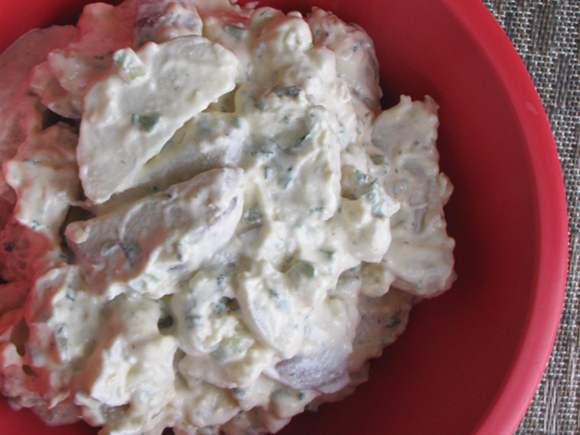 Well, a few days later I decided to whip up the mayo/sour cream salad. I guess his request just kind of stuck with me. My husband dropped off a container for my dad, and about two hours later (right on time) he called with his critique. He said it was good but it was missing eggs. Sorry, dad, eggs weren't going in. I like hard boiled eggs by themselves, but not in a potato salad. In my opinion, if you want eggs and mayo you might as well make an egg salad. But egg, mayo and potato? Nope. But hey, if that's your type of thing, go ahead and add a few to this salad! There are so many other extras that can be added to this simple base, too. Red pepper would probably be really good and it would add an nice color. I had some leftover ham so I chopped it up to mix with a little of the salad and it made it even better. Deli ham would probably work, too. The possibilities are endless so just go nuts! 2. Slice potatoes in half lenth-wise then into 1/4" thick slices. 3. Once water boils, add the potatoes and bring back to a boil. 4. Cook over medium heat for about 10 minutes or until just tender. 6. Mix dressing ingredients together and add onion and celery. Stir well. 7. Fold dressing into potatoes (be careful not to break the potato pieces) and chill for at least 1 hour. *Depending on the size of your potatoes, you might need another tablespoon or two of mayo and sour cream so the salad isn't too dry.